Goya was one of Spain’s greatest painters and an internationally influential printmaker during the late eighteenth and early nineteenth centuries. 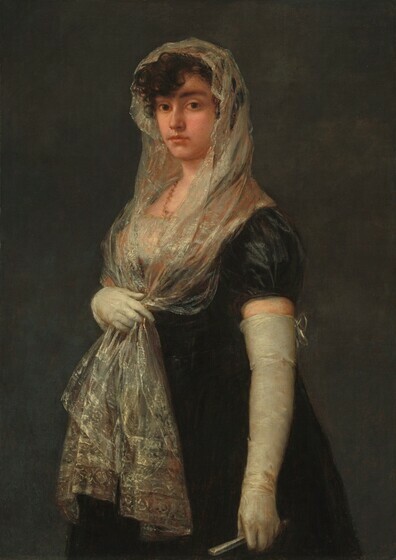 Francisco José de Goya y Lucientes, after training in Saragossa and traveling in Italy, married the daughter of the Spanish court artist. The next year, 1774, Goya received his first royal commission—painting decorative scenes of daily life to be woven into tapestries. In 1799 he was appointed first court painter, the highest artistic position attainable. Goya’s earliest portraits reflect the airy landscape settings and shimmering pastel colors of his tapestry designs. As he matured, and particularly after he lost his hearing due to a serious illness in 1792, Goya increasingly sought psychological characterizations of his sitters, often spotlighting them against dark, shadowed backgrounds. 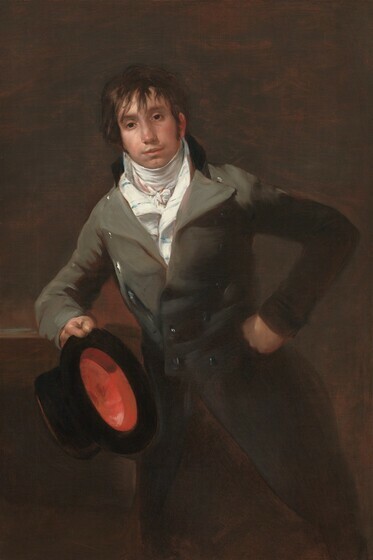 Goya’s major portrait commissions began in 1783 when he was thirty-seven. 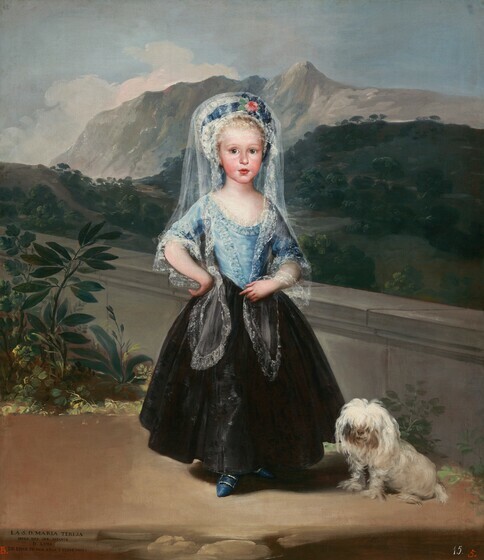 In August and September of that year, Goya painted a suite of family likenesses at the request of the Spanish king Carlos III’s younger brother, including this charming image of the prince’s daughter. 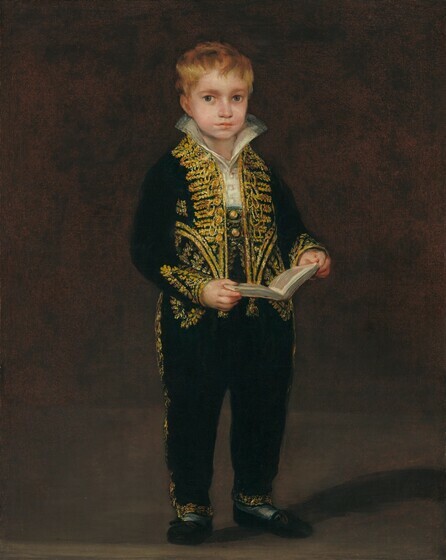 At the lower left, Goya inscribed in Spanish: “The Senorita Doña Teresa, daughter of the Most Serene Infante, Don Luis, at the age of two years and nine months.” The child actually was four and a half; why Goya misstated his royal sitter’s age is unknown. As an adult, Teresa was married to Manuel Godoy, the infamously corrupt prime minister to Carlos IV. Her support of Spanish independence during the Napoleonic wars brought her great popularity. Teresa stands on the terrace of her father’s country palace near Avila, in the mountains west of Madrid. Goya adapted this format from Spain’s seventeenth-century court artist, Diego de Velázquez, who had portrayed royal children outdoors with dogs. Goya worked rapidly, often improvising his designs; this and the loose, fluid brushstrokes also follow Velázquez’ example. Doña María Ana de Pontejos y Sandoval delicately fingers a pink carnation, an emblem of love that is often shown held by brides. 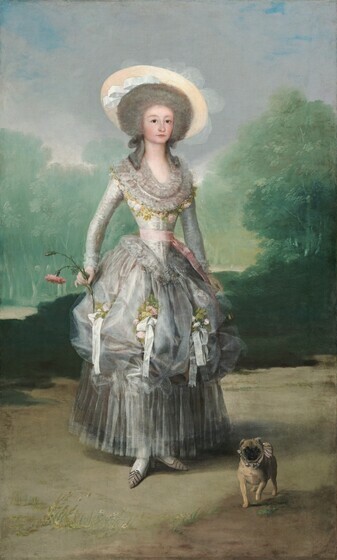 In 1786 at age twenty-four, she married the brother of the Conde de la Floridablanca, Carlos III’s progressive prime minister. At that time, her husband served as Spain’s ambassador to Portugal. The marquesa’s pug dog with its ribbons and bells echoes the stiff, doll-like pose of its mistress. Her elaborate coiffure, straw sun hat, and flower-trimmed gown imitate the attire of Marie-Antoinette, the French queen who sometimes dressed as a shepherdess. This extravagant, foreign-influenced costume accentuates the marquesa’s tightly corseted waist, fashionable among Spanish noblewomen. Her erect, regal bearing and aloof gaze derive from Velázquez’ royal portraits. As a designer of tapestries, Goya eliminated unessential details that would have been difficult for the weavers to execute. This tendency toward simplified design affected his portraiture, too. The jade-green trees and pearl-gray dress here are described in broad, sketchy areas of color. The mantilla, a gauze and lace headdress that drapes over a woman’s shoulders, is a distinctly Spanish form of attire. Also unique to Spain is the basquiña, a short-sleeved overdress for outdoor wear. This canvas, known for more than a century as “The Bookseller’s Wife,” may instead represent a character study of an upper-class woman. As yet unidentified, she is much like some figures in Goya’s tapestries that show Spaniards from all walks of life. The blue and white ribbon of the Order of Carlos III appears prominently on the jacket of Antonio Noriega Bermúdez. His knighthood, a list of other offices, and the date 1801 are inscribed in Spanish on both the tablecloth and the paper in the sitter’s hand. 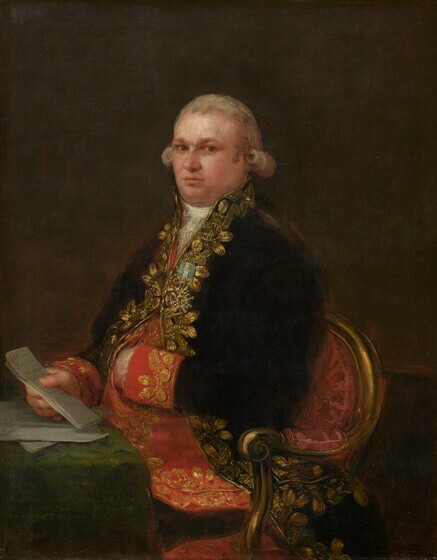 Don Antonio was knighted on 23 July 1801, and Goya’s portrait may commemorate that event. As is customary in portrayals of government officials, Goya depicted Spain’s high treasurer at work. In a gesture of nonchalance, Don Antonio rests his hand inside his unbuttoned vest, implying his authority and control over the country’s finances. In truth, his administration was disastrously inefficient, nearly doubling the national debt. While fleeing from the Napoleonic invaders in 1808, Don Antonio was assassinated by Spaniards who, mistakenly, thought he had collaborated with the French army. Sureda served as director of the Spanish royal textile, crystal, and ceramic factories. He first studied manufacturing and printmaking in England in 1793-1796. Upon his return to Spain, he taught Goya the new graphic arts technique of aquatint. In 1800-1803, Sureda worked in Paris. Goya painted Sureda and his new French bride, depicted in a companion portrait, Thérèse Louise de Sureda, also at the National Gallery of Art, probably shortly after they moved to Madrid. In 1804, at age thirty-five, Sureda took over Spain’s famous porcelain works at the Buen Retiro. In Goya’s representation, the arts administrator leans in a relaxed manner and dangles a high-crowned hat. This informality reflects the current international taste for casual poses. The hat’s hot red lining complements the warm brown tones of the loosely brushed background. Thérèse Louise Chapronde Saint Amand met her Spanish husband while he was in Paris to study the manufacture of textiles and porcelains. Although her portrait was painted in Spain, she epitomizes current French styles. Her hair is combed in the “antique” manner, and her empire armchair is decorated with “Egyptian” heads. Although little is known of her, letters she wrote after her marriage in 1803 reveal her scathing disapproval of extravagance in others. Thérèse sits erect with a self-conscious propriety and does not rely on the chair’s back for support. Since she holds her arms close to her torso, her form is tightly confined. Goya’s matching portrait of her husband, Bartolomé Sureda y Miserol by contrast, shows a much more casual figure leaning to one side, with arm akimbo. 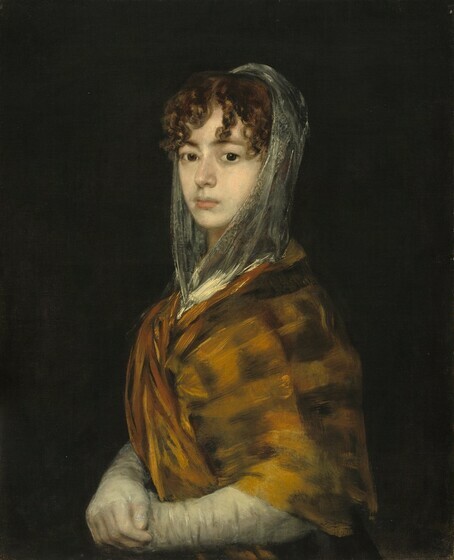 Known to her friends as “Sabasa,” Maria Garcia Pérez de Castro was the niece of Evaristo Pérez de Castro, Spain’s minister of foreign affairs and one of Goya’s leading patrons. A legend is associated with this picture that, like many anecdotes, may contain an element of truth. 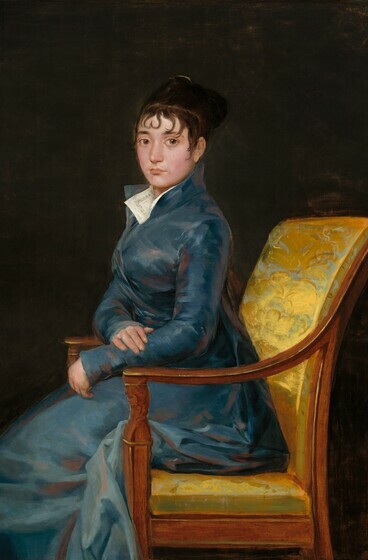 While Goya was painting her uncle, Sabasa visited Pérez’ house, and the artist, struck by her beauty, supposedly asked permission to portray her. The sheen on Sabasa’s gold shawl is a dazzling display of Goya’s brushwork. Goya painted spontaneously and he rarely reworked his canvases, thus retaining the immediacy of his first impressions. The nephew of one of the most important French generals in Spain, the young Victor Guye wears the uniform of the Order of Pages to Joseph Bonaparte, Napoleon’s brother who had been appointed king of Spain. At six or seven years of age, Victor was probably too young to act as a court page. Even so, he might have been permitted to wear the prestigious uniform through his uncle’s influence. Goya re-created the uniform’s gold braid with scintillating flecks and daubs of impasto or thick, pasty-textured paint. This picture matches a companion portrait of the boy’s uncle, General Nicolas Guye, now in the Virginia Museum of Fine Arts, Richmond. In 1810, Nicolas commissioned both pictures as gifts for his brother, who was Victor’s father. The sympathy with which Goya depicted the French conquerors might suggest he favored the Napoleonic regime, but the artist created equally sympathetic portraits of leaders of the Spanish resistance. This picture was inspired by Goya’s many paintings, drawings, and prints of bullrings. Goya often troweled on thick paint textures with the flexible blade of his palette knife, just as this later follower did. 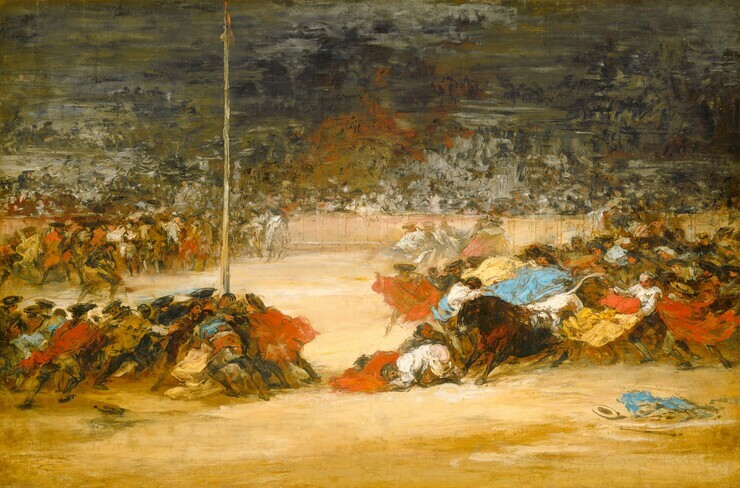 Goya’s own works accurately convey the danger to professional athletes. Lucas’ humorous design, however, places two folk contests inside a formal arena. During fiestas, young braggarts compete in climbing greased poles and in racing before bulls set loose in city streets. With a foolhardy impudence, one youth kneels—pants dropped—to mock the bull.